Status: Uncommon regular spring and fall migrant west, rare casual central. Fairly common regular breeder western Panhandle. Documentation: Specimen: UNSM ZM7444, 12 Jul 1901 Indian Creek, Sioux Co.
Taxonomy: There are two subspecies recognized (Pyle 1997, Gill and Donsker 2017): taverneri, breeding from southeast Alaska and western Canada to northwestern US, and breweri, breeding from south-central Canada to west-central USA. Subspecies taverneri is recognized as a full species, Timberline Sparrow, by a number of current authors (Rotenberry et al 1999). Arrival is in mid-Apr. Reports east of the breeding range from Lincoln and Keith Cos indicate a spring migration period 18 Apr-19 May. Migrants occur primarily in the western Panhandle and occasionally eastward to Sheridan (Rosche 1982), Lincoln, and Keith Cos; one was near Haigler, Dundy Co 21 May 2009. High counts: 70 in Banner and Kimball Cos 18 May 2008, and 24 in Banner Co 6 May 2000. Summer: The core breeding range in Nebraska is limited to high plains grasslands in the western Panhandle, usually where western sagebrush (Artemisia tridentata subsp.) and greasewood (Sarcobatus vermiculatus) occur (Rosche 1982). Breeding in western Box Butte Co occurs near Kilpatrick Lake (Rosche 1994), and several nesting pairs were in sand sage prairie 27 miles west of Alliance in Box Butte Co 29 Jun 2006 (Mollhoff 2006, 2016). Two singing males were found in southwest Kimball Co 16 Jun 1997 in atypical habitat, one in a young hedgerow in Conservation Reserve Program (CRP) bromegrass (Bromus sp.) and the other in roadside clumps of CRP bromegrass; two were using CRP grasslands in Kimball Co 18 Jun 2004. In recent years there have been reports further east in the Panhandle and southwest. Singing males were present in a disjunct northward extension of sandy grassland about three miles south of Chappell, Deuel Co 12 Jun 1976 (Faanes et al 1979), and there is a summer report 11 Jul 1992 Cheyenne Co. An adult was carrying food in Dundy Co 21 Jul 2000. There is a breeding season report for Morrill Co 2006-2011(Mollhoff 2016). Summer reports at likely breeding locations are 22 Jun 1973, 7 Aug 1992, and 17 Jul 1994 Dawes Co, and two were near Box Butte Res, Dawes Co 2 Jun 2008. There are Jun-early Aug specimens from Scotts Bluff Co 1913-16 (UNSM ZM7439, ZM7441, ZM7443, ZM7440), and Kimball Co in 1919 (UNSM ZM7442). Mollhoff (2016) reported a small increase, from six to 10, in the number of BBA blocks the species was reported in between the first (1984-1989) and the second BBA projects (2006-2011), but overall observer effort also increased markedly between the first and second BBA projects. BBS trend analysis shows the species has declined annually by -14.64% (95% C.I. ; -21.44, -7.14) 1966-2015 (Sauer et al 2017); this analysis has limitations, however, because of the small number of BBS routes on which the species is reported. Additional BBS data (Sauer et al 2017) and the Second Colorado BBA (CBAP 2016) do, however, suggest the species is declining at the eastern edge of its range in the Great Plains. Departure is during Sep. As in spring, migrants are reported east to Sheridan, Keith, and Lincoln Cos.
Reports in late Jul where breeding is not expected are of early migrants. Such reports are 21 Jul 2012 Sowbelly Canyon, Sioux Co, several at Wind Springs Ranch, southern Sioux Co 30 Jul 2001, and another there 9 Aug 2012 that may have been displaced by extreme drought conditions that year. The only documented reports east of the breeding range are specimens UNSM ZM7432, taken at Long Pine, Brown Co 20 Aug 1919, and HMM 28373, a female taken at North Platte, Lincoln Co 3 Oct 1954. Additional easterly reports that are probably correct are of three in Sheridan Co 29 Aug 2014, three in Sheridan Co 23 Sep 2018, reports cited by Rosche (1994) that it was an “uncommon migrant” Jul-Aug 1977 in Keith Co, two reports cited by Tout (1947) for Lincoln Co 6 Sep 1937 and 6 Oct 1926, and one at Sutherland Reservoir, Lincoln Co 19 Aug 2005. High counts: 50 in Scotts Bluff and Banner Cos 3 Sep 2000, 45 in southwest Kimball Co 22 Aug 1999, and 42 there 29 Aug 1998. 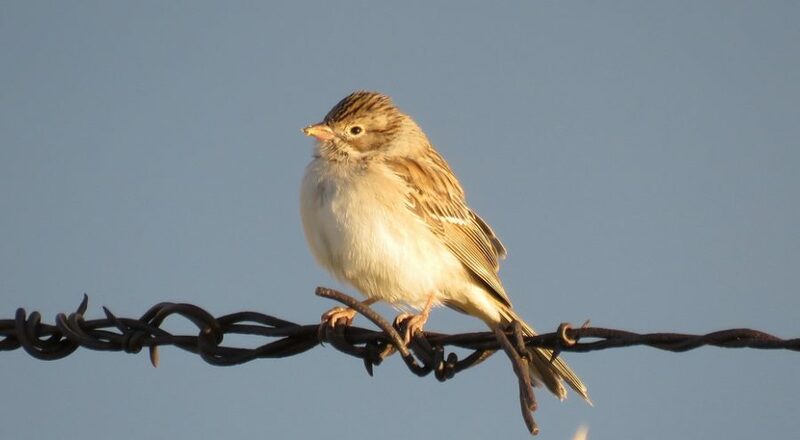 Comments: Wayne Mollhoff provided information from notes made by L. M. Gates of a visit to Scotts Bluff Co in 1913 with Swenk in which five nests of Brewer’s Sparrows (originally thought to be Clay-colored Sparrows) were observed at the University Experiment Station Farm. There are no recent breeding records from Scotts Bluff Co. Photograph (top) of a Brewer’s Sparrow at Sowbelly Canyon, Sioux Co 6 Sep 2016 by Michael Willison. Faanes, C.A., B.A. Hanson, and H.A. Kantrud. 1979. Cassin’s Sparrow- first record for Wyoming and recent range extensions. Western Birds 10: 163-164. Rotenberry, J.T., M.A. Patten, and K.L. Preston. 1999. Brewer’s Sparrow (Spizella breweri), version 2.0. In The Birds of North America (A. F. Poole and F. B. Gill, Editors). Cornell Lab of Ornithology, Ithaca, New York, USA. https://doi.org/10.2173/bna.390.